This week I hosted dinner for six, despite the Singaporean weather conditions in New York right now. It's been in the high 90s°F and low 100s°F (that's 36-38°C) with outrageous humidity for days. Needless to say, I knew everyone would be thirsty. So I thought back to my trip last year to Thailand, Malaysia, and Singapore. There were fresh or frozen fruit drinks everywhere: smooth blended mango, creamy banana, frothy coconut, mildly tart dragonfruit. My mouth is watering just thinking about them. One of the prettiest drinks, though, was watermelon with its deep blush. Before everyone came over last night, I ran out and bought an 18-pound watermelon. Lugging it against my abdomen (and thinking, "Even twins wouldn't be this heavy in the womb! "), I carted it home, hacked it up, and put as much as I could fit in a blender, about a quarter of the melon. I sliced some pieces to eat immediately, cubed another quarter of it and tucked it into the freezer, and put the rest in the fridge. Whatever fit in the blender was whirred into liquid oblivion. I added a few tablespoons of syrup (sugar water) and poured a few glasses over ice. A bottle of St. Germain (a sweet elderflower liqueur) near my side, I asked Boyfriend to try boozing one up. Delicious, but a little too sweet. The pureed watermelon had more pulp than I expected. Bits of roughage slide around on your tongue and teeth as you sip. If I had been cooking a mire elegant dinner, I might have strained it, but on a night too hot to do more than set out ingredients for make-your-own burritos and simmer a pound of black beans, rustic but cooling beverages were just fine. Today, I returned to the pile of watermelon in the freezer, determined to get an even icier drink out of it. Because the frozen chunks would need more liquid to blend, and because I wanted to add another flavor to the drink, I made some ginger syrup and added a few tablespoons for every two cups of blended watermelon. Blend watermelon and one or two tablespoons simple syrup (or sugar dissolved in a little warm water) in a blender until smooth. Pour immediately over a lot of ice. For a smoother and more elegant version, strain the beverage before serving. Garnish with mint, basil, or a lime twist. 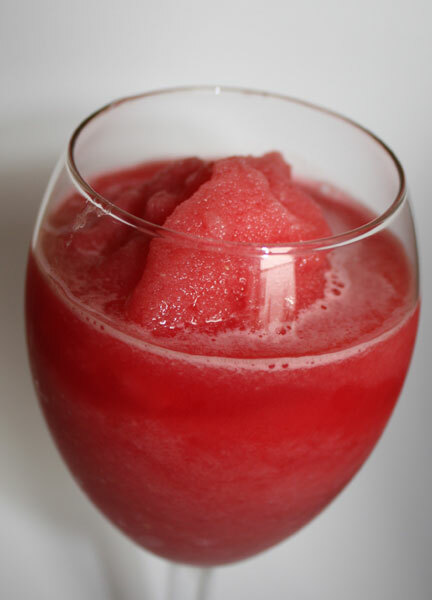 Blend both fresh and frozen watermelon in a blender until smooth. Stir in St. Germain. Serve immediately. Blend all ingredients in a blender until smooth. If the frozen watermelon is stubborn, add a little water or simple syrup to get it to move. Taste to adjust sweetness and bite or flavor of the ginger, adding water, simple syrup, or more fresh watermelon if the ginger flavor is too strong. Serve immediately.